Finding org charts of specific companies is not easy. There is no place you can go, of which I am aware, to purchase and immediately download an org chart of a target company of your choice. Rather, you likely will need to hire a research firm to build the org chart for you from scratch. Naturally, you may wonder why we are including information that you can use to build charts yourself. You may even ask why we are listing other org chart research firms in addition to us. We know what kind of information we’d want if we were trying to get our hands on org charts of companies that we wanted to study. We’d want the information necessary to figure out how to get the org charts we need. What follows is everything you need to know to build or buy company org charts. 1.2 Who uses org chart intelligence? 1.4 What is the definition of an org chart? Org charts are simple but powerful things. They give you line-of-sight into an organization, whether it is a direct competitor, a company in an adjacent industry, or another kind of organization entirely. Business schools that include The Kellogg School of Management at Northwestern University teach the value of original organizational chart research of other companies. “Analyzing a firm’s organizational structure can . . . reveal much about the competencies and areas of competitive advantage within the organization” — according to research by David Besanko, a Professor of Management and Strategy at The Kellogg School of Management at Northwestern University, and by his colleagues Pierre Régibeau and Katharine Rockett of the University of Essex. The “managers, analysts, and consultants” who use org chart intelligence include executives (at your competitors, perhaps), Wall Street analysts, and management consultants at the leading strategy consulting firms. In other words, financial services firms, investment banks, and hedge funds glean insights from organizational charts to make lots and lots of money. Strategy consulting firms that include McKinsey & Company, Bain, and Boston Consulting Group use the information they develop from org charts to help their clients become more profitable. Put another way, competitors are like ogres who want a piece of you. Dreamwork’s co-founder and producer Jeffrey Katzenberg injected that important business, if not life, lesson into his animated motion picture Shrek. Because ogres are complex creatures, you must take steps to understand them. Custom org charts show you how companies are structured. They reveal the layers. By definition, an organizational chart is a graphical description of who reports to whom, all the way up to the Chief Executive Officer. 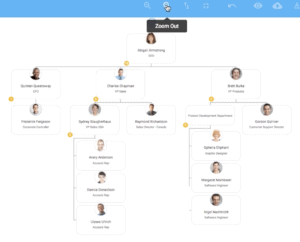 In one glance, an org chart shows you the company’s structure — the divisions, departments, and/or product teams. It shows you talent distribution geographically. It tells you where the company makes things, where it sells things, where it is pulling up stakes, and where it is setting down roots. Wall Street uses org charts to evaluate companies for investment purposes. The graphical depiction of a company enables analysts and investors to see how a company has set itself up. For example, investors may see companies with an extremely hierarchical and centralized structure as bureaucratic and slower-moving than decentralized, product-centric companies. Increasingly, the competitive advantage goes to those fleet of foot. Sales, marketing, and account management teams use org charts to identify and cultivate relationships with potential clients. Sales teams regularly use prospect org charts to navigate the complex relationships of key executives involved in making buying decisions. Org charts ensure marketing teams have the information they need to influence the decisions of enterprise decision makers. Account management executives also use org charts to hold their clients close and grow the account. Org charts are regularly used for recruiting. They show executive leadership and talent acquisition teams what kind of talent is located where. Org charts are, quite literally, graphical depictions of talent pools. Org charts combined with candidate profiles help speed time-to-hire. Organizational charts and candidate profiles combined with market intelligence reports raise the bar even higher. They help companies better understand what it will take to hire the talent they need. An executive and employee hierarchy shows you who they are. You don’t fully grasp all that a company is until you see the organization laid out in front of you. Is the org chart centralized with lots of levels, or is it flat and distributed? Is it customer-centric, organized around customer groups, or product-centric, or both? Do most employees work out of company headquarters, or do they have offices wrapped around the world? Custom organizational charts are designed to bring order to data chaos. They organize company and employee information that, in its original form, is wildly disorganized. There is no way you can figure out a company’s structure by visiting a social media profile or reviewing a single contact record in your CRM database. Original org chart research transforms unreliable information into data that can be trusted. For instance, LinkedIn profiles are often outdated and frequently lack important career and contact detail. In fact, you no longer can export the contact information that your first-degree LinkedIn connections have shared with you. Moreover, significant slices of talent do not hang out on LinkedIn. For example, we’ve observed many highly sought-after AI and data technologists avoiding LinkedIn. They simply don’t need to go there. Original org chart research takes steps to QA information. Org chart research, when coupled with candidate profiling, builds out richer, more comprehensive corporate biographies, uncovers hidden talent, and develops contact information that’s yours to use and keep. The end org chart product is designed to be actionable, and it avoids wasting time on unreliable data. Org charts help you fill “impossible to fill” openings. For example, data science and artificial intelligence searches are notoriously challenging, so much so that news of the shortage made the New York Times in Tech Giants Are Paying Huge Salaries for Scarce A.I. Talent. What’s an employer supposed to do with that information? Increasingly, our clients are asking us to deliver org chart research with our State of the Market intelligence reports to inform their thinking about what kind of talent they need. The intelligence report helps our clients figure out what talent pools to target and what to avoid. It also tells them how other companies are coping with the shortage. The report details what perks and benefits they offer to attract and retain talent. Increasingly, clients are conducting this research to inform corporate and talent acquisition strategy before they initiate a critical executive or technology search. Org charts, when combined with intelligence reports, enable you to spot patterns you would not otherwise see. Imagine all the things executives and technologists do at leading companies. Their activities generate information ripe for analysis. Intelligence reports focused on the talent ecosystem help a company become more competitive and more profitable. For example, one such analysis that we did for a leading Fortune 100 technology company shaved six months off of the product development cycle, identified emergent competitors, and teed up companies for M&A. The return on investment for that org chart engagement amounted to millions of dollars. One of the biggest mistakes we see is companies ordering up org charts when what they really need is a tight list of target potential candidates or clients. If you are working on a tactical level, you likely do not need an org chart. If you need intelligence to inform your talent acquisition strategy, investing in an organizational chart makes sense. Org chart research, by definition, is labor intensive. It also takes investigative research expertise. Consequently, if you want to build it, your internal team will need to have the necessary research abilities, the tools, and the time to gather the information. After they develop the data, you’ll need a software program or cloud solution to transform your data into a chart. Insperity’s OrgPlus enables users to create org charts in Powerpoint, Adobe Acrobat, as well as in HTML format for an internal website. Like most of the solutions mentioned here, OrgPlus can build the organizational chart automatically. All you need to do import a spreadsheet of employees that includes a column for the direct superiors of each person in the chart. The only person that typically does not have a designed direct superior is the CEO. OrgPlus also allows users to customize the format and look of the chart as well as determine what fields are displayed. 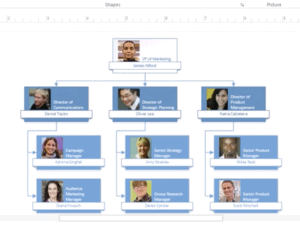 Microsoft Visio is another software program that can be used to build org charts. In fact, Microsoft has a “Create an Organizational Chart” video that shows you how to do it. 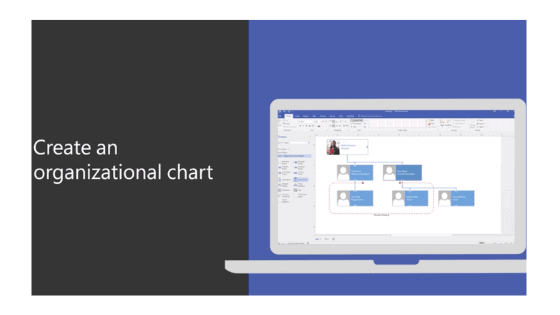 While you also can use PowerPoint to build org charts, Visio makes it easier. Although you can manually create the org chart using different shapes in the Shapes pane, Visio provides an automated way of importing information about a target company from an external source. For example, when you have the data ready to go in a spreadsheet, Visio builds the org chart for you with a simple import. 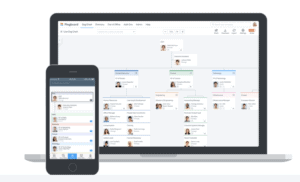 Pingboard offers a cloud solution that makes it easy to share org charts with team members online. You can check out Pingboard for free to see whether you like it. Pingboard lists its subscription pricing on its website. The $99 per month level seems suited for org chart projects targeting a handful of companies. That level offers 5 planning charts in addition to 1 live chart for your organization. In other words, you have six slots that can be used to hold different company org charts. If you want to maintain organizational charts on more than a half dozen companies, you other solutions mentioned here are worth considering. 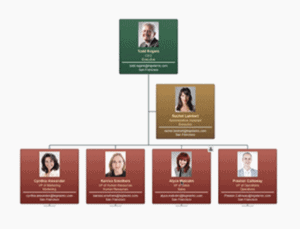 Organimi makes it easy to create, share, and maintain organizational charts. For $99 per year, you can get 5 org charts. For $249 per year, you can create up to empty 20 org charts. For $599 per year, you can create up to 50. It seems designed to accommodate using the org chart solution for mapping other companies. (For comparison, Pingboard, for comparison seems more designed for companies that want to chart their own organizations.) You can download Organimi charts in Adobe Acrobat PDF and PNG formats. You may also share the chart via a URL and by email. While there are plenty of software programs that will help you display data in the form of an org chart after the research is complete, you still need the data — at a minimum, the name, title, company, and direct superior — to populate the org chart. So if your team lacks the time, resources, and/or expertise to develop the reporting relationship intelligence, you’ll likely need to turn to an organizational chart research firm like Intellerati to conduct the original research for you. Database subscription services offer company and employee data-as-a-service with reporting relationships included. You don’t get the traditional graphical depiction an org chart to study with all the boxes. Rather, in the database’s list view, direct reports are indented under the direct superior. B2B database firms decide in advance what companies they will research. A client can’t specify what companies the firm covers or how deep the org chart goes. You can’t request that the chart focus on a specific type of talent, function, product team, division, or geography. You get what you get. Subscription publications offer some org charts as content. The organizational charts are designed to be viewed online behind a paywall, which you may access after you log in as a subscriber. Typically, the selection is small. You don’t get a research product with biographies and contact information that help you reach out to the people in the chart. But since the information is at the ready, it is worth considering in case the company you are seeking is one that they cover. Org chart wikis are websites that are created and edited by volunteers around the world. Research contributed by volunteer users is subject to error. Unlike the leading Wikipedia, org chart wikis do not appear to have a large enough or active enough user base to catch errors and contribute up-to-date content. Consequently, it is difficult to tell how reliable the information is. However, one org chart wiki appears to be taking steps to augment and QA the information. Custom research firms, including Intellerati, conduct original org chart research focused on the target companies that you want. In other words, they conduct the research just for you. The org chart research does not get shared with anyone else, such as your competitors, which gives you a competitive advantage. In addition, you typically have more control. You should be able to specify what the chart focuses on, such as how many levels you map beneath the CEO. You should be able to work with the firm to ensure the chart focuses on the kind of people who matter most to you. Moreover, you should be able to specify the kinds of information (fields) you want the firm to develop besides name and title. How do you determine who reports into whom? How do you verify reporting relationships? What do you do in the absence of that verification? What other information do you attempt to confirm and how? How many total researchers do you have? For subscription service, we recommend you ask yourself whether it is physically possible for their researchers to keep the database current. To do that, estimate a typical number of reporting relationships they’d be responsible for keeping current (along with the title, contact information, and other crucial details). For example, a large company CEO typically has a leadership team of a dozen or more Executive Vice Presidents and C-level executives. To ballpark, let’s say each of those 12 executives has 8 senior vice president direct reports (12 x 8 = 96), and each of those SVPs has 8 vice president direct reports (12 x 8 x 8 = 768). That’s 768 relationships to verify at just one company. When you multiply that number by the total number of large companies in a subscription database, you end up with 2.5 million contacts whose reporting relationships need to be kept current. that the researchers are responsible for keeping current. There are millions more to be counted among the database’s medium and small companies . . .
Aqute is a competitive intelligence firm that offers organizational chart research. The org chart blog posts that the company offers on its website suggest they know their stuff. 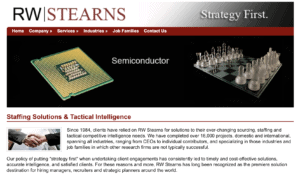 The company does not list the names of any of its leadership on its website. The company prefers to operate in permanent stealth mode. In fact, Aqute’s analyst job posting lists one job requirement as “Discretion. Our clients expect discretion, and so do we. The less the world knows your name, the better.” If your org chart project is super-duper top secret, that might work for you. 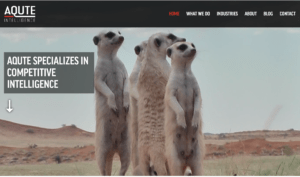 The meerkats work for us. 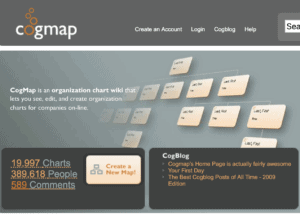 CogMap is a wiki platform that enables crowdsourced org charts. Users contribute org chart information, but it looks like the website is on auto-pilot. Large global companies have a fraction of their organizational charts mapped. Both Google’s and Amazon’s charts haven’t been updated since April 2017. Amazon has 132 people listed, but its total company headcount is 613,300 employees. Google’s org chart has just 41 people. (Google has 94,372 employees.) The last post on the CogBlog was in 2014 and because the site uses http:// in its url, the site is not secure. 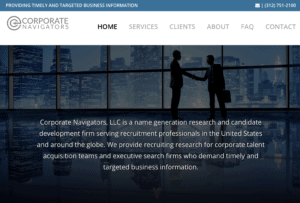 Corporate Navigators is a recruiting research firm that provides org chart development. It builds custom organizational charts, outlining the corporate hierarchy and reporting relationships at all levels and functions throughout a company – from individual contributor level all the way up to the CEO. Once the company completes the recruiting research, it builds the classic org chart depiction of the corporate structure and delivers the product in multiple formats. While its prices are not listed on its website, the company charges a flat hourly rate for all of its services. 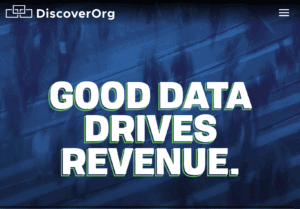 DiscoverOrg is a B2B data provider that offers data with reporting relationships built in. It doesn’t produce an org chart per se. Rather, it is a database that displays reporting relationships by indenting them under their bosses in a list view. Of all the research firms, it is the biggest that just made itself even bigger by acquiring ZoomInfo. There is no way to purchase individual org charts from them. Rather, you must subscribe to categories of the data. At last check, each data set goes for $24,000 a year, with the exception of their C-suite dataset, which is $12,000. 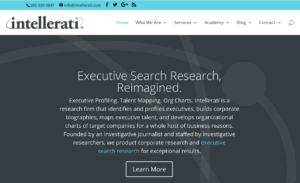 Intellerati is a boutique recruiting research firm that offers org charts along with reports listing the profiles for each person to make org chart research actionable. The report includes biographies, contact information, and available profile photos for each executive. The org charts are tailored to the preferences of clients and often are delivered with a State of the Market intelligence report that includes a detailed analysis of the information. The research is conducted by expert researchers, most of whom come out of investigative journalism. Intellerati’s flat fees are based on the amount of work and level of difficulty of each engagement. SGA Talent is a recruitment research firm based in Amsterdam, New York. The recruiting research firm offerings include Organization Chart and Talent Mapping. The data gathered also provides intelligence used to help clients make informed hiring decisions. 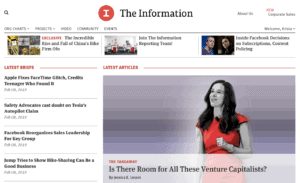 The Information is a technology publication that also offers organizational charts for 14 tech companies that it follows. You need to log in with a subscription at $399 per year to view the org charts on their web interface. In other words, you can’t download them. The companies for which they offer org charts currently are as follows: Airbnb, Amazon, Aptiv, Coinbase, Didi Chuxing, Disney Streaming, Facebook, Lyft, Netflix, Snap, Tesla, Uber, Walmart, and Waymo. Like our team, their discipline is journalism. Here, they explain how they do the research for the charts. The Official Board says it provides the org charts of some 75 thousand companies with $100 million in revenue. The decision-makers’ details (Board, N-1, N-2) are hourly updated by its web movement detectors. A yearlong subscription costs $299. The Official Board lists 532 executives for Amazon. However, that number is so small it resembles a mere rounding error when compared to Amazon’s 613,300 total employees. Organizational charts start aging the moment the org chart has been completed. Changes in leadership and reorganizations have a way of making mincemeat out of custom org charts. Their half-life, on average, is about 9 months. At that point, while some of the research will remain correct, there will be enough outdated information to make it an unreliable representation of the company. By a year and a half, so much information is incorrect it makes more sense to start from scratch than to attempt to update the original chart. For one-off studies of target companies, you don’t need to worry about maintaining org chart research. However, for companies you want to continually track, we advise refreshing the information quarterly. Organizational chart research done well is a form of competitive intelligence. To qualify, it must do more than simply gather information about reporting relationships. Rather, it must analyze the information to transform it into actionable intelligence that informs business strategy. It is all about connecting the dots and seeing patterns others miss for competitive advantage. That is why org charts are powerful things. They are not to be underestimated.